Drop them a message. Why not? You have absolutely nothing to lose. Yes, it may be slightly nerve racking but someone’s got to do it! *Message box pops up* Argh! Ok, don’t panic, he/she is just a normal human being (please read my post “Our Ethos”). Just take it easy. If you saw the funniest clip on YouTube and even if he/ she totally needs to see it, probably refrain from adding this to the message chain at this point. I recommend going with the flow. Oh, and one top tip: don’t go adding them on Facebook unless they suggest it. This may come across as a little bit stalker-ish. Just because you find them on Facebook, it doesn’t mean it’s cool to add them as a “friend” just yet. 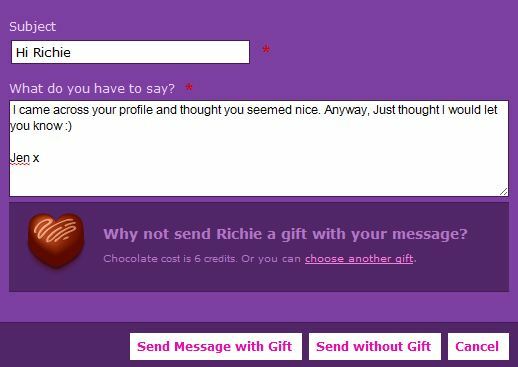 Hmm…I wonder if Richie has messaged back……..